The March 2009 CAA News has been posted to the CAA website as a PDF download. Printed copies for individual and institutional members will be mailed next week, with your copy arriving in early March. Highlighted in the issue are the four 2008 recipients of CAA’s Professional Development Fellowship Program for graduate students: Mary Reid Kelley, Yale University; Justin Shull, Rutgers University; Nichole N. Bridges, University of Wisconsin, Madison; and Wendy Ikemoto, Harvard University. Six honorable mentions are also named. In the Publications section, CAA announces the appointment of Katy Siegel as the next Art Journal editor-in-chief. In addition, the editorial boards of our three journals—The Art Bulletin, Art Journal, and caa.reviews—and the Millard Meiss Publication Fund Jury all seek new members. Read the calls for nominations and self-nominations inside. 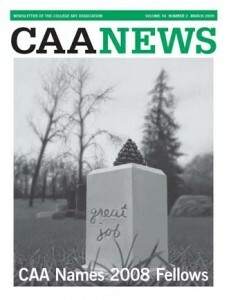 The deadline for submissions to the May 2009 CAA News is March 10. Please read the newsletter submission guidelines or write to Christopher Howard, CAA managing editor.